Seaweed meal for horses . For a long time, animals such as sheep, cattle and horses that lived in coastal areas have eaten seaweed,especially in Ireland where brown seaweeds were washed ashore. Today the availability of seaweed for animals has been increased with the production of seaweed meal: dried seaweed that has been milled to a fine powder. 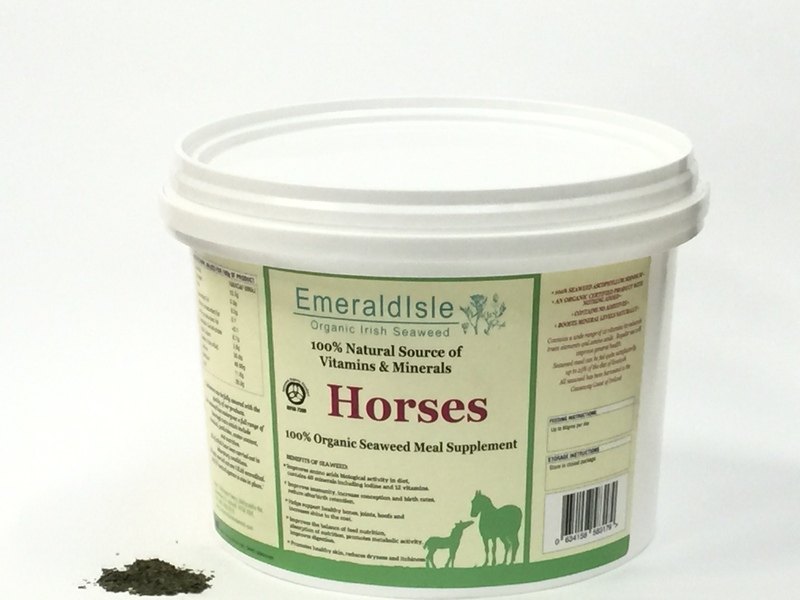 Organic seaweed meal for horses. 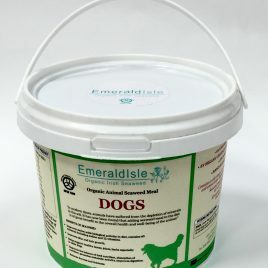 8 kg of 100% Seaweed (Fucus vesiculosus) packaged in a closed lid bucket. An organic seaweed product with nothing added, contains no additives no fillers. .All seaweed has been harvested in the North Atlantic Coast of Ireland. Certified Organic by the Irish Organic Farmers and Growers Association. 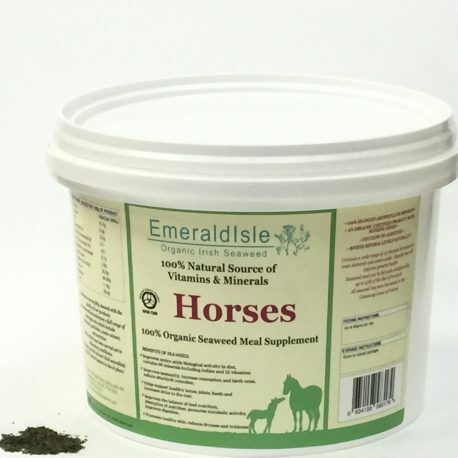 Reputed Benefits of Emerald Isle Horse Seaweed. Improves amino acids biological activity in diet, contains 60 minerals including iodine and 12 vitamins. Improves immunity, increase conception and birth rates, reduce afterbirth retention. Helps support healthy bones, joints, hoofs and increases shine to the coat. 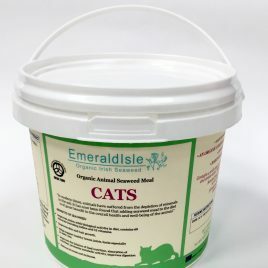 Improves the balance of feed nutrition, absorption of nutrition, promotes metabolic activity, improves digestion. Promotes healthy skin, reduces dryness and itchiness. Up to 80 grams per day. Seaweed is not recommended for pregnant mares in late pregnancy. Nutritional Values for 100g of product. Protein 13.7 Fatg/100g, 0.2 . Saturated Fat g/100g 0.2 . Poly-unsaturated fat < 0.1 . Available carbohydrate, g/100g 8.7 . Total Sugars g/100g 3.6 . Dietary Fibre AOAC, g/100g 36.8 . Emerald Isle Seaweed have carved a niche in the seaweed market by developing a traditional process of harvesting seaweed. Seaweed is hand cut from below the low tide mark. This ensures only the best seaweed is harvested and ensures the preservation of the crop for future generations. Our harvest is then hung by hand in a specially constructed drying room. Our seaweed meal has undergone a full range of thorough tests which include chemical, pesticides, water content, and nutrition,. All tests have be done in laboratory conditions and is UKAS accredited. HACCP control system in place. For a long time, animals that lived in coastal areas have eaten seaweed, especially in Ireland where brown seaweeds were washed ashore. Today the availability of seaweed for animals has been increased with the production of seaweed meal: dried seaweed that has been milled to a fine powder.